Okay, now that I have your attention, I'll go ahead and clear things up right now because fall isn't here of course. 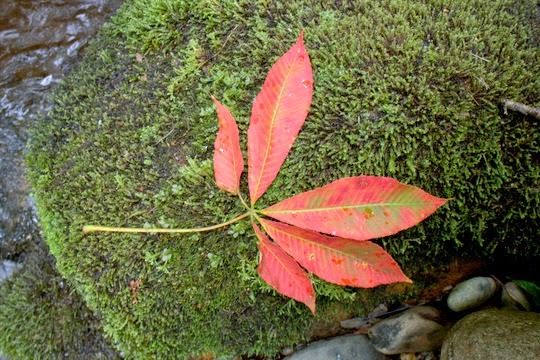 That said, you wouldn't know it based on the beautiful leaves I found on a mid-stream rock on Thursday. Guiding a father/son team, I noticed the leaves and stopped for a quick picture. Thoughts of beautiful fall days with hungry trout were soon dancing in my head. 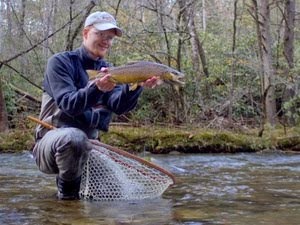 Drifting down the Caney catching those fired up browns on streamers, or maybe fishing the big caddis over in the Smokies to try and get a rise out of some of the best fish of the year, whatever your preference fall has something for everyone. I know it seems premature to think about, but it will be here before we know it and I can't wait! Spending a lot of time on the water with clients as I did this previous week will get you thinking about how to help someone catch more fish under conditions that, while not optimal, are not yet truly terrible. 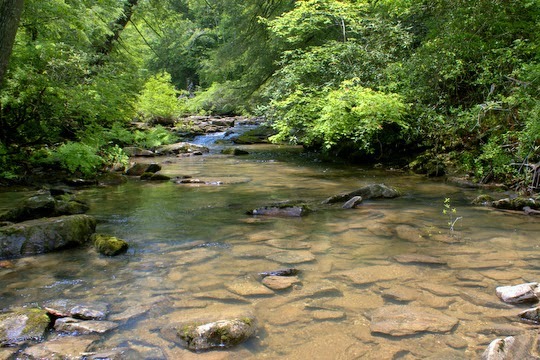 Anyone who remembers the drought years of 2007 and 2008 can remember the Smokies streams being a trickle. 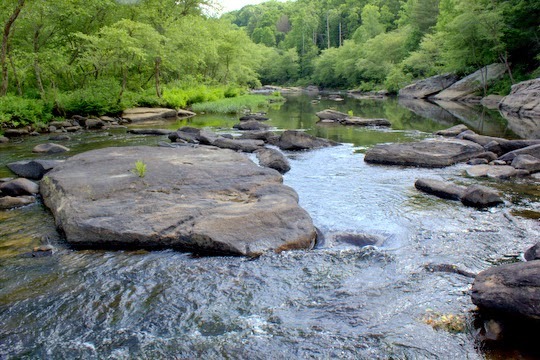 Little River got down around 25 cfs at the Park boundary. Compared to a normal spring time flow of around 300-450 cfs and a normal summer flow of perhaps 100-150 cfs, 25 is a really small number. This year we are seeing water conditions that are less than the long term average but thankfully not dangerously low...yet. So, what's a fisherman to do when the conditions get tough out there? 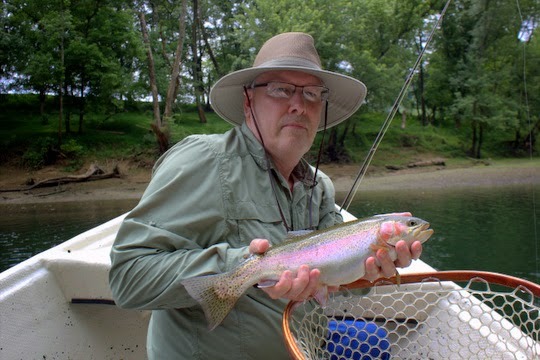 Answering this very question for several clients this past week got me to thinking about all the little things that a veteran Smokies angler does without even thinking, but without doing them the average angler will catch only a few trout. That's too bad because this time of year can be as good as any if you focus on a few things that you should be doing differently as compared to earlier in the year. Having already addressed this topic for the Little River Journal a few years ago, I suggest you read my thoughts here and here. I'm going to revisit some of these items as well as address some new ones. For this particular post, I'm only going to focus on one issue: stealth. Now, I'm going to guess that if you have read this far, you are probably nodding your head in agreement. However, I'm going to approach the question of stealth from a different angle than usual. 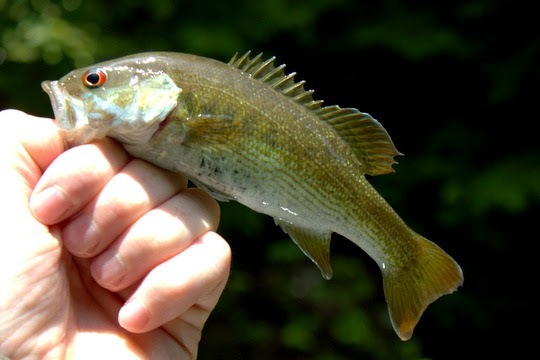 You see, being stealthy often means sneaking around on the trout stream, making sure the fish don't see you, keeping a rock between you and that next fishing hole, always approaching the fish from behind, and I could go on and on. All of those things are great, and I've written a lot in the past on the importance of each of those. Here's the shocker: the difference between a good fisherman and a great fisherman is not in any those things. Oh sure, a great fisherman will do all of those things, probably without even thinking about it, but they are very easy to learn and even a beginner can pick it up very quickly. Will doing those things increase your catch rates? Of course. However, hear me out on this one. Let's say that you are pretty much a beginner and would consider an outing in which you caught 5 trout to be a great trip. By adding in the above mentioned items whose sum is basically being stealthy, that beginner might move up to catching 10-20 trout. If you're a beginner you are probably salivating at that. As soon as I tell you that the great fishermen are likely catching 50-60 fish or more (100 fish days anyone? ), 10-20 fish is no longer good enough. What else can you do to catch all those extra trout? Right flies, right place, right presentation. Sounds simple enough, but consider that the last two both hinge on your ability as a fly caster and your line control once the flies have been cast. Presentation and getting your flies in the right place involve many things, but if you do not have exceptional line control and great casting ability, having the right flies is nearly useless. Improving as an angler means you have to become a competent caster and have impeccable line control once you have made your presentation. These things do not come easily. They are born of many hours of practice, both at home on the lawn or casting pond and on the streams. 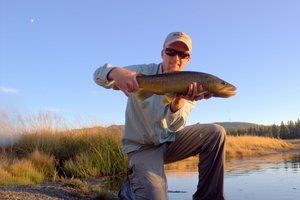 To excel at mountain fishing, it is rare that you will ever need to cast a long distance, but the ability to cast a long distance will make you better at line control and overall presentation. In fact, while most anglers are sneaking as close to a run, pool, or other section of stream as possible, I'm fishing the same water from 10-25 feet back, allowing my longer casting distance to keep me far enough from the trout so they don't spook. 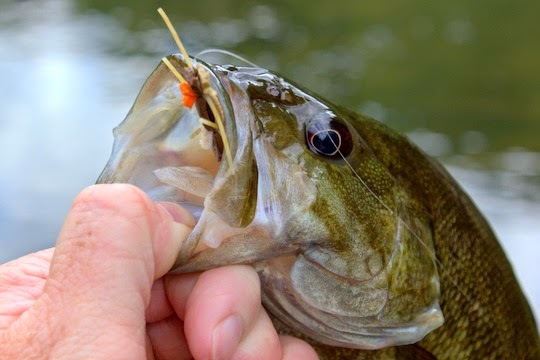 Here's the best part: becoming better at line control and better as a caster will only happen through a lot of practice, so clearly you need to get out and fish more if these are areas in which you need to improve! There it is, the perfect excuse for more time on the water. Guess what? I have to fish more, because I realized I need to become a better caster... I can hear the conversations now. Right now I'm feeling thankful for several guided trips that are keeping me busy as well as more trips coming in. If you are hoping to get out on the water with me in the next month, book as soon as possible to make sure you get the date you are looking for. To book a guided trip, please visit the Trout Zone Anglers contact page or email me at TroutZoneAnglers@gmail.com. Fishing in the Smokies has been good but not great. Fish are steadily eating the usual summertime favorites including terrestrials, Yellow Sallies, Golden Stones, and Isonychias. If you are fishing terrestrials, don't overlook ants, beetles, and inchworms as good options. 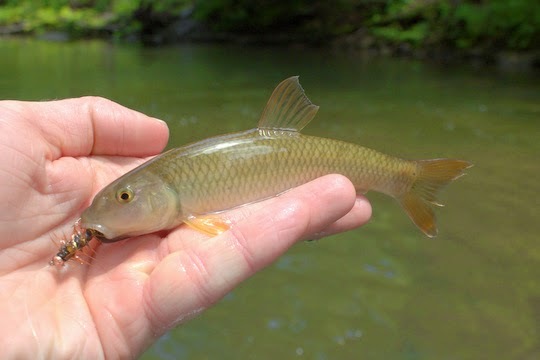 Hoppers are rarely important in the Smokies as very few end up in the streams. The tailwaters are fishing well. We are booking float trips on the Caney Fork for July now and expect good conditions for float trips with a nice mix of low and higher water. This allows for anglers to throw nymphs and dry/droppers part of the day with hoppers, deep nymph rigs, and streamers becoming more important the other times. The variety is nice and will keep anglers on their toes. Crowds are out in force so plan to book your trip for a weekday as we are avoiding the river on weekends if at all possible. Checking tracks is nearly automatic for me at this point. 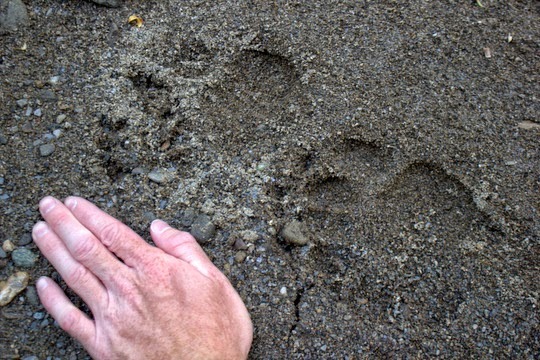 No matter where I am, tracks are at minimum an interesting curiosity. On some days, the ability to "read sign" can make the difference between catching a few fish and catching a bunch. Yesterday, my friend Nathan and I were on a popular stream but far enough from the trailhead that we thought it was at least possible we were on fresh water. The few small rainbows that did eat our flies had has questioning that premise. A few indistinct tracks had us both questioning openly whether that section had been fished. When I found some water drops drying on top of a rock where none could naturally have splashed, I knew someone else had waded through in the last few hours. Right where the tracks ended, I caught a nice fish. Further up the stream, before we hit the spot where we would jump out and start our hike back, I found some more tracks. Fresh ones. Big ones. Tracks that had me glancing all around and even up in the trees. After all, we were no more than a half mile from the scene of my tent fiasco from a few years ago. 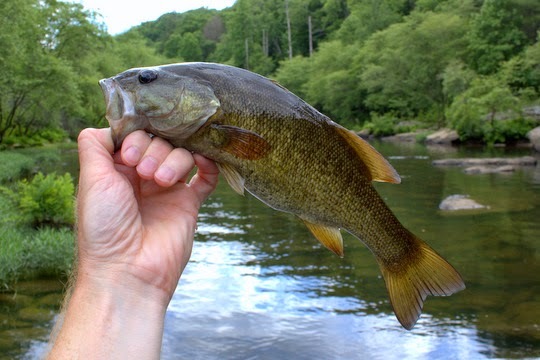 As the Plateau streams drop and clear, the smallmouth action is heating up with the weather. 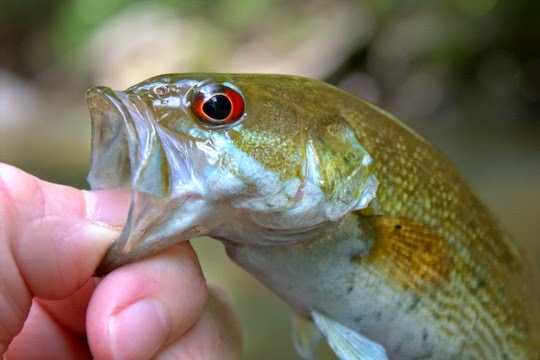 Low clear water means spooky fish but if you are willing to throw topwater bugs (who am I kidding, who wouldn't want to throw topwater bugs) then you can get onto some nice fish. Recently I made it back out to one of my favorite new streams that I've started to explore. The bass were eating well once we tied on the topwater stuff. The overall size was pretty decent on top as well although I saw a few monsters that spooked well before I ever got a cast on them. Those are the fish that keep me coming back though. The stream was beautiful and at a good level for throwing the topwater bugs. 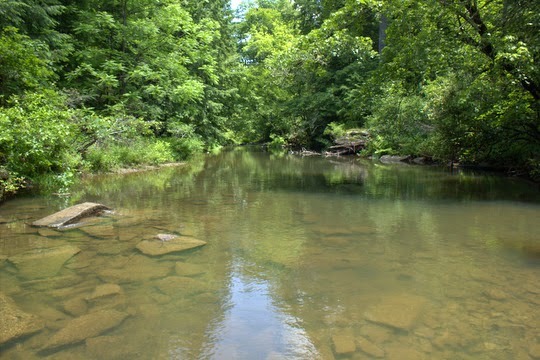 If you are interested in a guided wade trip in some of the rugged Plateau creeks, please contact me at TroutZoneAnglers@gmail.com or check out my good site, www.troutzoneanglers.com. Happy Father's Day to all the dads out there! I want to especially say happy Father's Day to my dad who got me started in fishing. 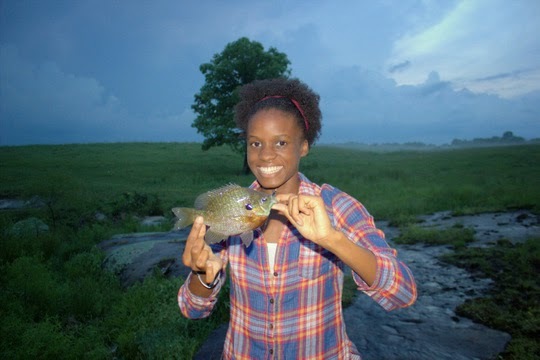 I'll always remember that first fishing trip. I was 4 or 5, it all kinda blends together, and my dad and grandpa took me to the local state park. Three monster (at least to a little kid) bluegill later, I was hooked. Over the years, my dad took me fishing. He didn't fish much himself, but was my ride and took me fishing for some good father/son time. Here's a picture from our Raven Fork trip a couple of years ago as well as a couple from a hike up Little River that we did together last year. Thanks for being a great dad!!! Fishing is as much optimism as anything else, but of course there is a healthy mix of knowledge involved in catching a few trout. Sometimes, there's even a little voice inside your head that convinces you to stick with it. I'm not sure if that's a good thing or not but when I'm catching nice fish who's to argue? Yesterday I had a 1/2 day guide trip in the Park. 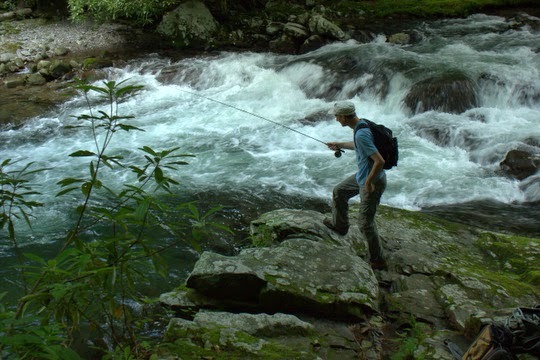 The morning was spent on a couple of different streams so my client could see a few different options when it came to Smoky Mountain trout fishing. After dropping him off and grabbing some lunch, I stopped by Little River Outfitters for a bit to say hi to Byron and Daniel and the rest of the crew. After getting an excellent first-hand report on the local smallmouth from Byron, I was almost tempted to skip heading back to the Park and chase the bass instead, but thankfully trout won out. On the drive down Little River to town, I had mentally been talking myself into fishing several good stretches. One in particular stood out, and I decided to return there. This is a beautiful section of pocket water interspersed with some smaller pools and a couple of deep runs. For some reason this short 100 yard stretch does not get fished nearly as often as a lot of Park water but that's just fine by me. I have always done well the few times I've fished it, and more people fishing it could very well put a damper on future expeditions. Having just eaten and glad to finally relax after working hard all morning, I took my time rigging up the usual double nymph rig. Some heavy split shot rounded things out well and assured I would be ticking the bottom. I began casting lobbing the heavy rig into the deeper water and right away caught a little brown on the dropper. At least I knew I was on fresh water. Working slowly upstream, I maneuvered back and forth across the stream. Catching a fish here and there, I noticed a nice deep slot against the far bank with a big rock on the stream side. Perfect home for a brown. Working carefully across the current, I was soon running my flies through the slot and alongside the rock. A small fish was quickly caught and released but that rock just looked like a spot for a nice brown. Time and again I got what appeared to be a perfect drift. Not wanting to waste time on a pointless spot, I eventually decided to move on upstream. That's when the little voice spoke up and demanded that I cast there once more. Something subconscious maybe? I don't know, but that gentle tap as the flies drifted up under the rock yet again was definitely real. 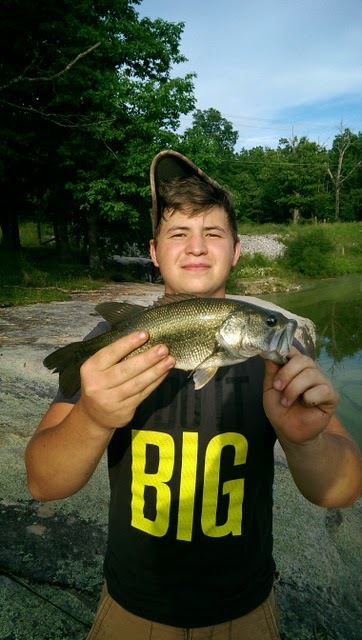 When I set the hook, I felt the hesitation and quickly came tight on a nice fish. For its size, the fish really fought well, surging back and forth across the stream every time I tried to lift its head and slip the net under. 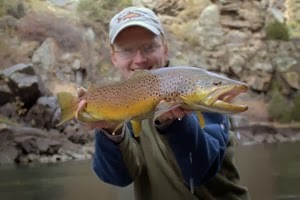 That it was a pretty brown trout was obvious and naturally gave me extra incentive to be careful and not lose it. Of course, in a short amount of time (that naturally felt like forever) I was slipping the net under the trout. 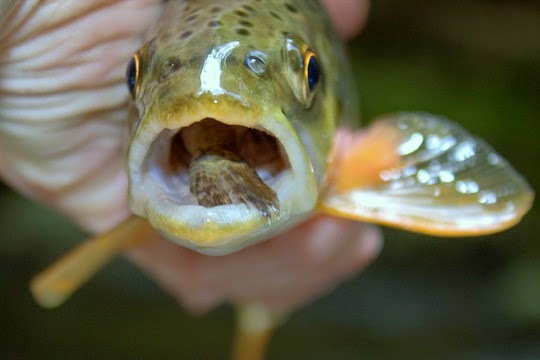 After a couple of pictures, I gently held the trout in the current until it was ready to go. All that effort to spend a minute or so with a fish probably seems ridiculous to some, but I was awfully happy at that moment. The rest of the evening was anticlimactic. The Yellow Sally hatch never came on strong although there was some egg laying activity that brought a few fish up. I stuck with the nymphs and caught a good number of rainbows and small browns, but probably I should have just quit after the nice trout. The time on the water was relaxing though and much needed. Catching that nice fish early allowed me to really slow down and focus on the experience for the rest of the time. I even stopped and took a few stream pictures, something I often forget to do in the rush to find more fish. Next week I'll be back at it. Maybe I'll just hit a small stream instead, or maybe I'll chase the larger browns again. Either way, I know I'll always have an enjoyable time in the Smokies! 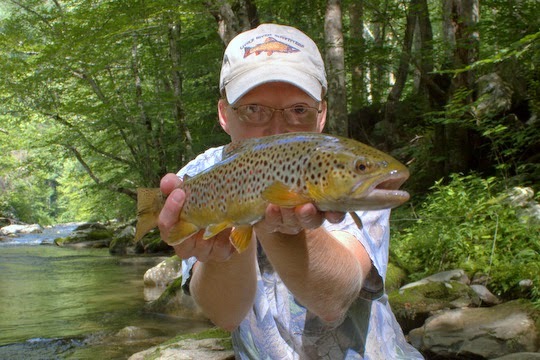 If you are interested in a guided trip in the Smokies for wild trout, please contact me at TroutZoneAnglers@gmail.com or check out my guide site, TroutZoneAnglers.com, for more details. 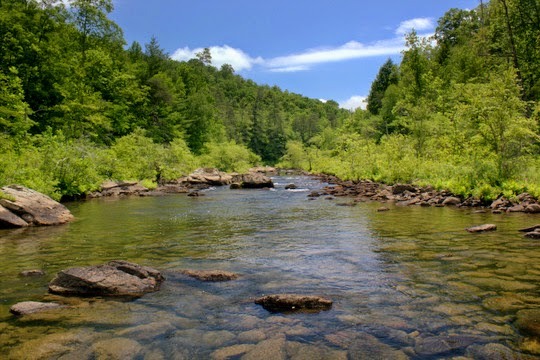 If you have ever fished in Tennessee, or if you ever hope to fish in Tennessee (seriously, we have some fantastic fishing), then please keep reading. 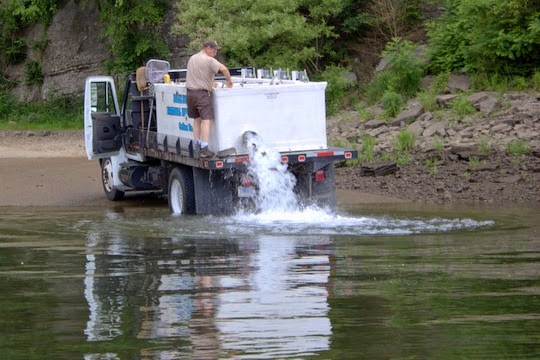 We currently are in the midst of a serious effort to fund our tailwater trout stocking program. 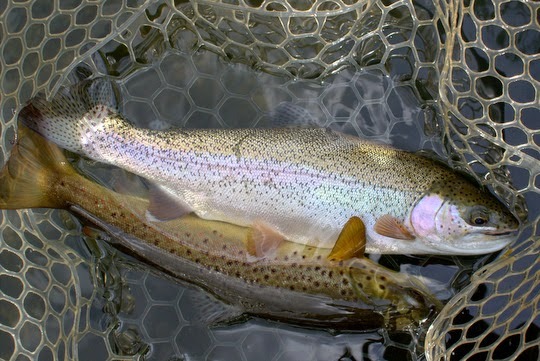 In short, the US Fish and Wildlife Service has pulled the plug on hatchery funding for trout. I'm not sure whether this has to do with the budget cuts over the last couple of years or not, but that is not that point. The important part is that we may lose a lot of stocked trout. That's where you come in. Please check out the document from the latest meeting first. It covers the alternative options. Please note that the USFWS has said that funding through them is not an option unless congress appropriates a LOT more funding than they currently have. So why is all of this important? 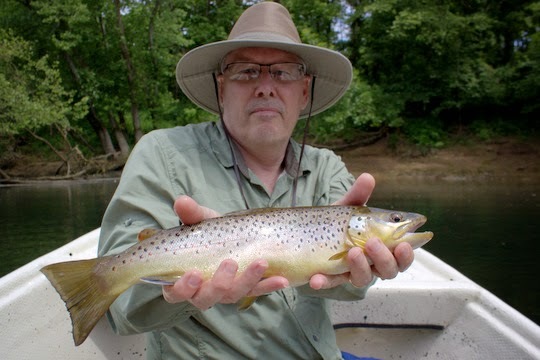 Well, we only have limited natural reproduction on most tailwaters, with the Clinch and South Holston being two of the best in terms of wild fish. 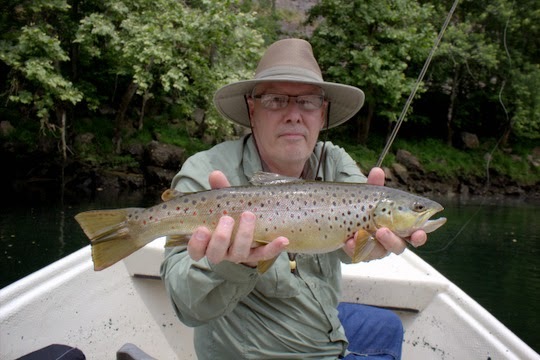 Imagine if all of the other tailwaters were more or less barren and the anglers that normally fished them now crowded onto the already crowded Clinch and South Holston? Even worse, imagine if all those tailwater anglers were so frustrated by the lack of quantities of fish (even on those rivers as both have lots of supplemental stocking) on the tailwaters and started hitting the wild mountain streams a lot harder. In other words, the Smokies might become a bring your own rock sort of place. I'm not too excited about that, and I hope you're not either. Personally, as TVA is responsible for the dams being in place that created this artificial situation where native species cannot thrive, I think TVA should foot the bill on this one, but that could definitely be debated. Ultimately it will be passed on to TVA rate payers as a rate hike. However, current calculations are indicating that a rate increase of 5-10 cents per year is all that would be required to get this thing funded. That's not bad. In the end, the most important thing you can do to help is to contact TVA so that they know a lot of people care about our tailwaters. It won't take much of your time, just go to http://www.tva.gov/hatchery/, read the page so you understand the issue, then scroll down to the bottom where you will find a link to submit comments. 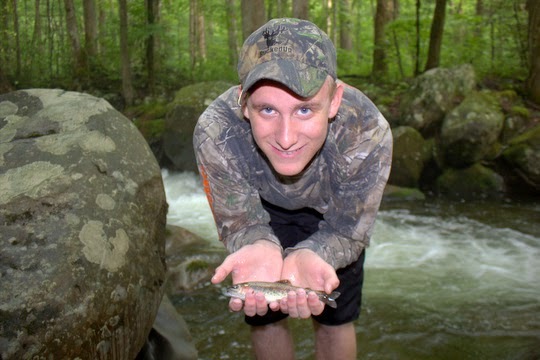 Let TVA know that you care about trout in our tailwaters and that you believe the trout stocking needs to continue. The more people that submit comments the better. They have to realize how many people are utilizing our waters and they need to understand the economic impact that a cessation of funding would cause. Thank you for taking the time to read about this issue and sending in your comments. With everyone's help, we can make a difference in maintaining the fantastic tailwater fisheries here in Tennessee!!! On Wednesday, I loaded up the drifter and headed for a tailwater. Rod had called to book a trip for him and his brother Barry who was visiting from out of state and wanted to show him a good time. We decided on a half day float and confirmed details on where to meet. Wednesday morning arrived and right on schedule they pulled in ready to fish hard! We headed on up the river to drop the boat in. Right as I was about to shove off from the ramp, another truck started backing down towards the water. Looking up, I laughed when I realized it was the trout truck! Good fishing for all, at least for a day or two! He waited until we had cleared the ramp so I rowed out a bit and dropped the anchor. This was a photo opportunity not to be missed. After joking about how guilty we would feel if we pestered the freshly stocked fish, we shoved off and caught the current downstream. A couple hundred yards down the river we started working our flies and right away we got the first fish in the net! Barry was the first to strike, but that made sense because he was in the front casting brace. The usual crowd of wading anglers were working hard so we maneuvered the boat to try and stay out of their way and were soon drifting down through open water. By this time Rod had started catching some fish as well. I turned to suggest another spot to Rod when I sensed that Barry had set the hook. Turning around I saw that he looked pretty serious. When he told me that the fish was ever better than the nice rainbow I got serious as well. The net came back out and before long we were celebrating a nice brown to hand with another picture! 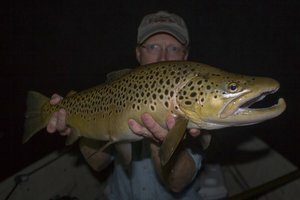 Barry said it was his largest brown ever so he was understandably happy about it. 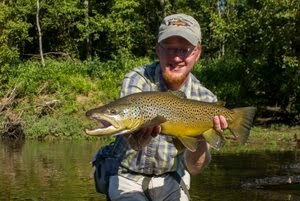 That brown ended up being the highlight of the trip, but we would have some other memorable moments. 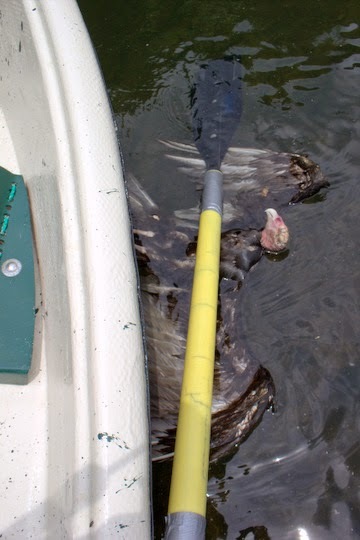 One of the strangest things that has happened to me in a long time while rowing the river was when a large dead vulture drifted down on us while we were anchored in a good spot fishing. I'm still not sure what happened to that poor bird. Even more strange was when his friends started circling overhead as he drifted downstream. I know they eat dead stuff but eating your buddy seems just a little strange. Another cool moment was when Rod and Barry doubled up. Barry had just hooked a nice rainbow when Rod hooked up as well as I was sliding the net under Barry's fish. I kept the net in the water and got the nice brown in it as well for a couple double shot. Finally we saw the takeout ramp approaching. Barry wanted to strike once more and put one more nice brown in the net to round out a good day on the water. These two brothers were great to have in the boat. They fished hard and even participated in the good natured joking around about who was catching the best fish that I started. In the end, honors for this trip went to Barry, but I'll bet that next time Rod will get a big one! I'm permitted to guide in the Great Smoky Mountains National Park and also do tailwater trips and Cumberland Plateau smallmouth bass trips. We're looking to add some smallmouth float trips in the future as well. On yesterday's float, we were anchored up in a really good spot and the guys were working hard to nab a few fish. While they were fishing, something strange was spotted floating down the river behind the boat. The slow current eventually brought it right up to the boat. How in the world did this large vulture end up dead in the river? Any ideas? Stories? Original works of fiction involving a dead vulture on a fly fishing trip? Fishing is dangerous. Many people think of fishing as something where you sit in a lawn chair and watch a bobber with a worm under it. While that is a perfectly good way to fish, people don't realize that many of the more adventuresome types are scrambling along rugged shorelines or through remote canyons in an effort to reach less-pressured water. There is good reason for that of course. Most people are lazy and a bit of effort can put you on water where the fish rarely if ever see a fisherman. On yesterday's smallmouth trip, we started to see significantly more action as we got farther and farther from the road. Several times over the course of the trip, I almost commented to the guy I was guiding about how I have never seen any poisonous snakes in that particular area even though they are rumored to be there in good numbers. Something kept nagging at the back of my mind though, and I kept my mouth shut. It turns out that just thinking about it is enough to jinx a person. While scrambling over rocks and through brush stream side, I suddenly froze like a bird dog coming to a point. In a small crevice right under the rock we had come over on the way down was a nice big copperhead just waiting for an unsuspecting fisherman meal. I've climbed over those rocks many times, often while only wearing sandals. 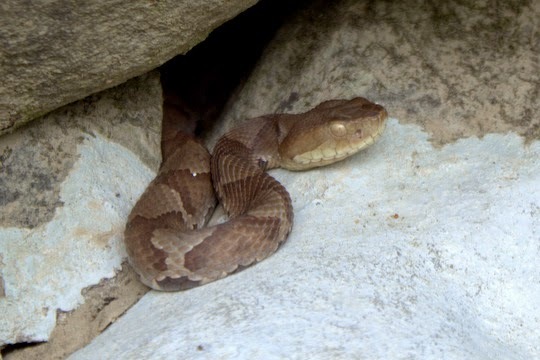 After I found my way back down to earth from the upper atmosphere where I had involuntarily jumped to, I realized the snake was still a good 6-8 feet away and got out my camera while keeping one eye checking the area for its mate. It has been my pleasure to help 5 different people catch their first fish on the fly rod this past week. Some were friends, some were clients, but all did a great job of learning and applying what I taught them to catch their first fish on the fly rod. The next was on a Smoky Mountain guide trip last Thursday. 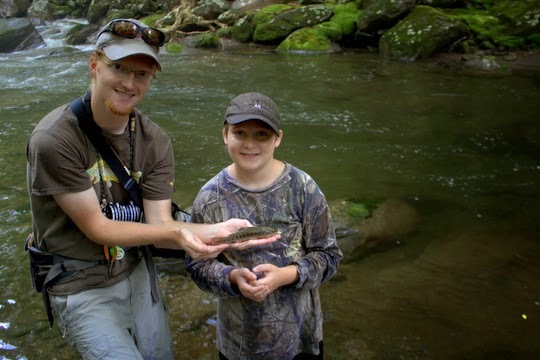 I had the pleasure of taking two young men for their first fly fishing trip in the Smokies and they did great! Perhaps the best was when I took my buddy Seth to the same spot where we were catching the bluegills shown above. He also received the 30 second lecture on casting and started throwing right where I told him. Before long a big bluegill had taken the fly. We admired it, and then I told him to throw back in again. Something hit with a huge swirl and started fighting really hard. When he pulled it up to where we could see it, we realized it wasn't a bluegill. 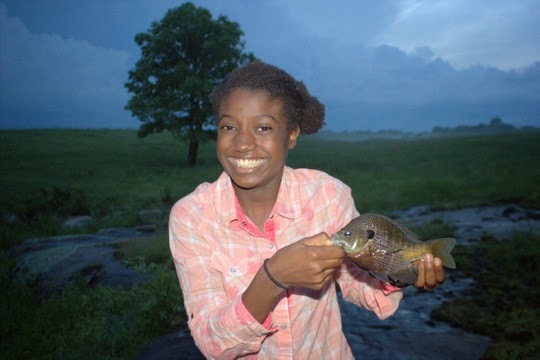 What a pleasant surprise when you're bluegill fishing!